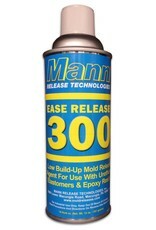 Mann Ease Release 300 is a high performance, production proven release agent formulated for polyurethane elastomers and epoxy resins along with excellent release of polyurethane elastomers and microcellular foams. Ease Release 300 leaves very little build-up on the molds resulting from isocyanate or epoxy reactions, while maintaining part cleanability with common degreasing solvents. Cleaned parts molded with Ease release 300 can be painted or bonded. Ease Release 300 is effective on all mold surfaces such as steel, aluminum, chrome, epoxy, and RTV urethane and silicone mold materials. Ease Release 300 is easy to apply, fast drying and effective over a broad temperature range from 70Ã¯Â¿Â½F to 500Ã¯Â¿Â½F.